The denialosphere is busy making another mountain out of a molehill. It seems that a bunch of emails from CRU have been stolen and published online. The authenticity of these emails hasn’t been verified and the possibility of some of them having been edited cannot be ruled out. But this hasn’t stopped the deniers from cherry-picking quotes looking for ‘proof’ that global warming is not real. This is all rubbish of course. 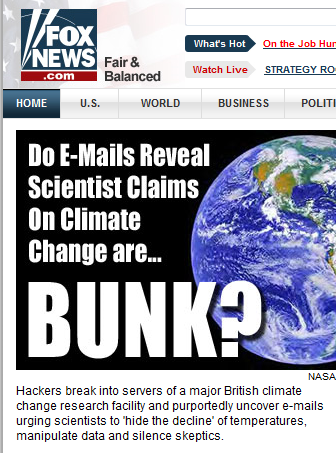 The proper response to flawed science (which climatology is not) is good science, not old emails. From what I have actually seen it just “shop talk” taken out of context and nothing more, very much as if a store clerk said they were going to go “hunt down some customers” and then someone else tried to claim that they were planning a murder. Context is everything, and we have none. It is also worth mentioning that if any misdeeds were committed, they should be criticized. Also if any science was indeed done improperly (seems unlikely given the scrutiny it has withstood) then it must be corrected. It is worth repeating that bad science needs to be corrected by good science, not the ranting of deniers, column writers or politicians. Is there really nothing to this? I think so. The edited bits we are getting can sound bad, but the actually say absolutely nothing. Stripped of context they could suggest all kinds of unethical behaiour … or nothing at all. Nothing we have seen so far actually says anything at all, but the Deniers swear this topples climate science (as mentioned, it couldn’t no matter what they found). The fact that deniers have jumped all over this shows again their disregard for the truth. They automatically assume the worst (so obviously they are not skeptics), without any evidence to back up their extreme claims. Anyone who jumped on this has revealed their true colours. They aren’t interested in finding truth… but we already knew that. That the alarmists stonewalled freedom of information requests seeking the data on which their graphs showing imminent doom are supposedly based. That they destroyed information subject to a freedom of information request. That peer review was fake – that it was review for theological, rather than scientific correctness, that peer review of alarmist papsers failed to check if the data supported the conclusions, or even existed. That improper pressures were applied to prevent dissident publications. That widely published graphs were fake (“hide the decline”) or unsupported by the data that they were allegedly based on. The readme file and accompanying data files reveal that alleged world average temperature supposedly based on surface weather stations does not correspond to their actual data from surface weather stations. I’ll give you that the emails show an unwillingness to share information with those who in all likelihood will misrepresent it. This is not defensible but it also is not the massive scandal some claim. It also doesn’t discredit any of the science. As for the rest of your claims you are going to need to provide, more evidence (and context!) to support them. Right now you have nothing. And as for the ‘hide the decline’, clearly you didn’t even bother to read my post, because that statement doesn’t mean what you think it means. Again one needs to look agt the context. Assuming the worst interpretation is the correct one doesn’t say much about whoever is making the assumption. Nothing you are willing to listen to. If you want the context for “hide the decline”, Climate Audit has the graphs in which the decline was indeed hidden. These guys knew what the true temperatures must be by the power of their faith, and if the data failed to show what it should, so much the worse for the data. I have better things to do with my time than delve into the depths of climate audit (hardly an honest broker here) in order to go looking for context of ‘hide the decline’. Especially when it is rather obvious (for someone with a clue) that it refers to the divergence problem found in some proxy data sets (specifically some bristle cone pine trees). See here for a paper on this issue. Im a chemist and I hide data all the time. Guess what,its neither decietfull,or dishonest. My instruments give me data that has lots of peaks for small impurities and such that I dont really care about as they are not the chemical that I am analyzing for. The very small ones just clutter the graph and make it difficult to see the important information. This is actually very common across most disciplines. I set the software to screen all that out. In some cases,the analyte is so dilute that it does not show up. In thse cases we can use a technique to get a bigger signal where we use a chemical reaction to change what he substance is into a form that the instrument can more easily detect. Lets rephrase this. OMG I just admitted to using an evil trick to make it look like there was more of a toxic chemical in the sample than there was… or did I? lets rephrasae it yet again. “I analyzed the samples and the amount of the toxic substance was below the detection limit of the machine. I used Daves TECHNIQUE of derivatizing the compound with something with lots of chlorine to get 10x the peak hight. The instrument can now properly detect the analyte,in fact its more sensitive to it now than any of the other analytes tested for. If I were to write something for public consumption,or expected the public to see it,I would of course write the latter. If I was writing to a collegue explaining what I did,I might write the former,using less formal language and not really writing with an eye to having it taken out of context. There are legitimate reasons to hide data. That much is obvious. But I don’t think anything was really hidden here at all. There have been several papers written on the divergence problem, and as Mark Francis points out in another comment even McIntyre write about the issue way back in 2005, based solely on what had already been published. So how exactly was it hidden? Omitting something from a graph is not the same things as hiding it.